In a concerted effort to make Glastonbury Festival more sustainable and to help Festival-goers consider their use of single use plastics, plastic drinks bottles will not be available at Glastonbury Festival 2019. Instead we recommend Festival-goers use a reusable water bottle. Water bottles can be refilled for free at every water tap and at the many WaterAid kiosks throughout the Festival site. We have a mains water supply from Bristol Water that is the same quality as your domestic supply at home. 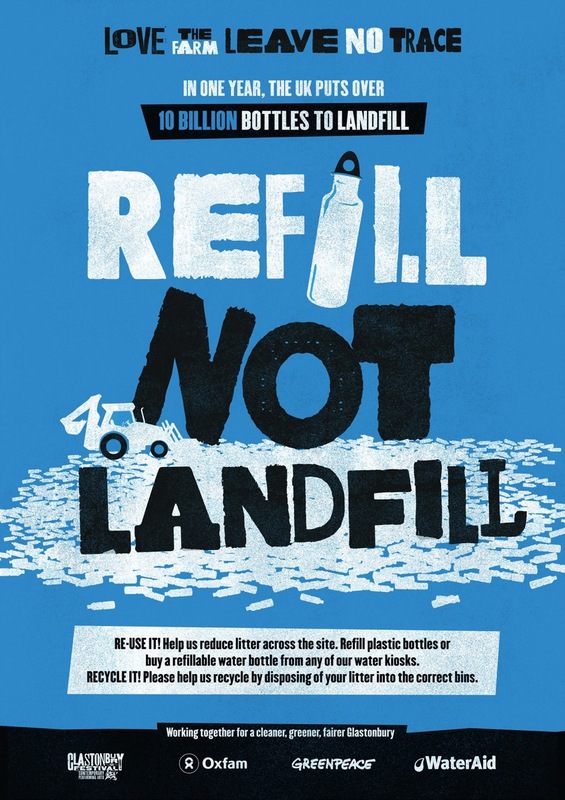 Refilling a reusable water bottle makes a huge difference to the volume of plastic bottle waste. WaterAid kiosks can be found at the following locations: The Mandela bar, The Cider Bus, The WaterAid stall by the Pyramid, The Stone Circle, The Park Ribbon Tower, The Other Stage Near Oxlyers Campsite, The Meeting Point and Family Camping above the Kidzfield.